So I happened upon this really cool Usborne book, and I just had to try it out with Mr. B! 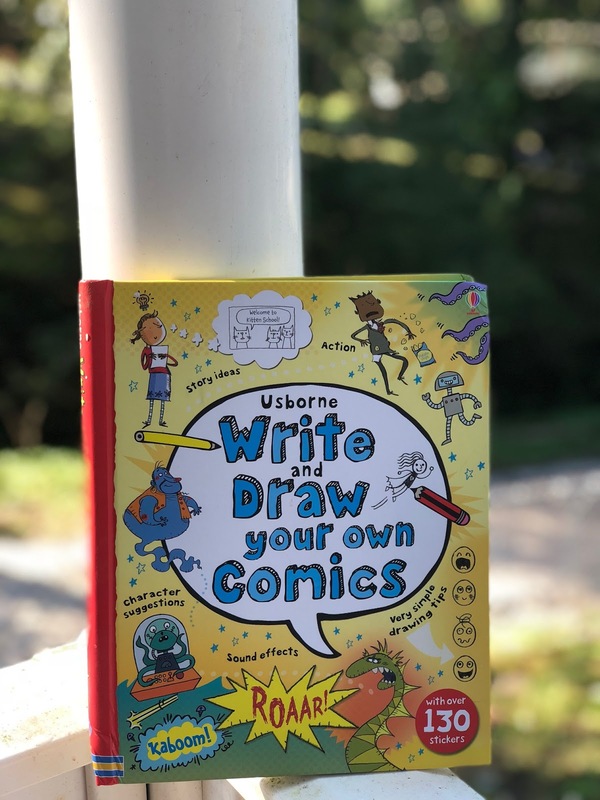 The Usborne Write and Draw Your Own Comics is a fantastic resource to get kids to write creatively. It helps build the skills of imagery, dialogue, and illustration. Pages: 96 pages plus an additional 4 pages of stickers. Material type: Hardback with an enclosed plastic spiral binding. First of all, Mr. B loves it. This is a kid who NEVER volunteers to write, and he asks for this daily. He likes being able to draw pictures to go along with the stories in his mind. The pages are full of art and words, but in a comic book style. There are a variety of stick (or stick-like) figures with word and through bubbles throughout. These characters are the teachers in the book. Each section focuses on a particular topic, beginning with a "How to" section. There are 24 different "chapters" or sections. How to use this book-this is your basic how to, and lists materials needed. Comics: the basics- This covers all you need to know about comics. It explains them, and details how to read them. This is great for kids who may not be fully familiar with comics. 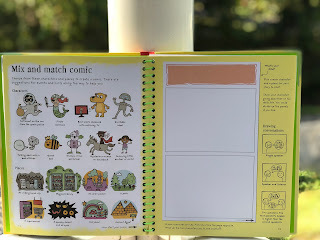 Making up characters-This activity helps your child create a character to be in their comic. Drawing characters-This explains how to properly size a character, as well as other drawing tips such as expressions and body type. Action drawings-This teaches how to add action to your comic through well placed lines. Speech bubbles-characters have to talk! This teaches how to convey speech in a comic strip. Sound effects- This teaches how to convey sound in a comic strip, and the importance of adding sound effects to enhance actions. 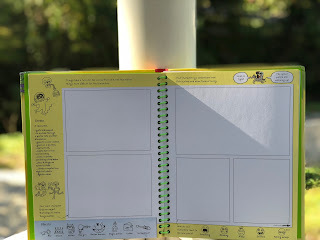 Once upon a blank-A fill in the black activity to work on speech and illustrations. 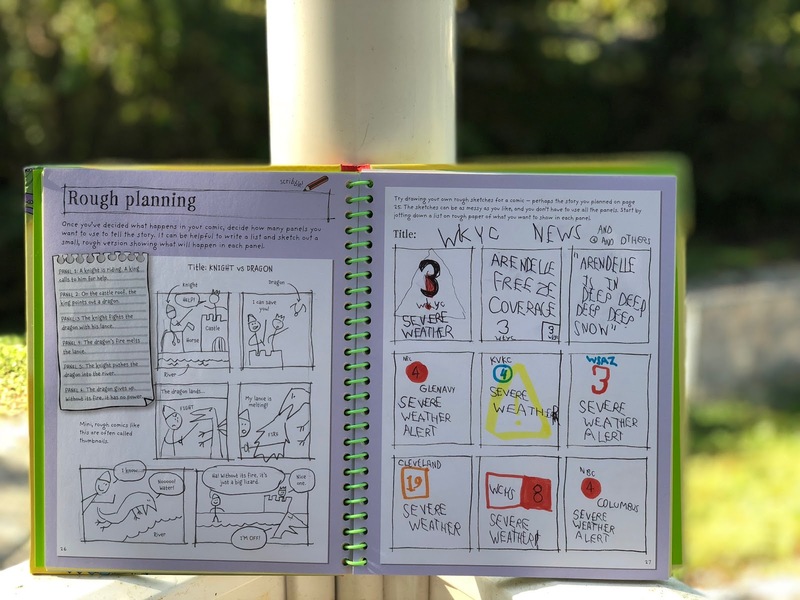 Plotting- Teaches how to create a beginning, middle, and end. Rough planning- Similar to outlining, this teaches your child how to plan out their comic strip. Pencils and inks- It's best to draw in pencil first, so that you can fix mistakes. Includes an activity for your child to trace over in pen. Your own comics- Titles for your own comics. The following are ideas to help your child develop their own comic. Each idea includes activities such as jotting down ideas, varying the scale of their drawings, etc. The pages are full of helpful information. A few last tips- A review and final few words of encouragement and help. Write and Draw Your Own Comics has been a lot of fun to work with. The pages are VERY colorful, and full of graphics. This can be a bit of a challenge for kiddos like Mr. B who are easily distracted, but at the same time they are full of useful information. There's a lot of little tidbits around the margins of the pages, and a lot of helpful guidance throughout. The spiral binding allows for the book to be opened flat for easy writing and drawing. There's ample space to draw your own comics. The book offers a lot of suggestions and guidance. Mr. B did this one on weather alerts. The end of the book features 4 pages of useful stickers. Overall, we have really enjoyed using this and highly recommend it to others! If you have used this please leave me a comment to let me know what you think!